Okay, I promised another giveaway of sorts, but this time there is a catch. Many of you are probably aware of the "Pay it Forward" handmade gifting sweeping through blogland. If not, here's the rundown. The first 3 people who comment on this post will get a mystery handmade gift from me within the next year (lots sooner, but that's what I signed up for), but only comment if you are willing to do the same on your blog. This way, love, joy, happiness, and handmade goodies will abound!!! Yippee, we have a winner! Hello owl lovers, I am here to announce Lula Dahl as the owl giveaway winner as chosen by the random number generator. Check out her etsy shop where she sells darling aprons and such. Thank you everyone for your entries and sweet comments! I am currently on vacation, but shortly after I return home I will have the Oliver Owl pattern available. I will also be doing another giveaway of sorts on Monday the 23rd so check back. 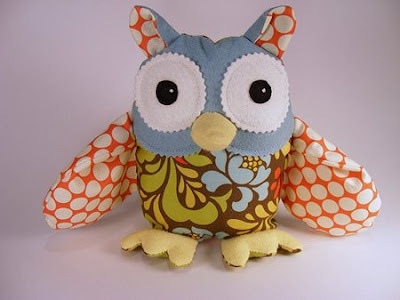 My Oliver Owl Softie was featured on Sew Mama Sew! How cool is that! In celebration I want to offer a giveaway of one of my Owl softies plus a copy of my Oliver Owl pattern so you can make as many darling Oliver's and Olivia's and... oh, you can name them whatever you want. 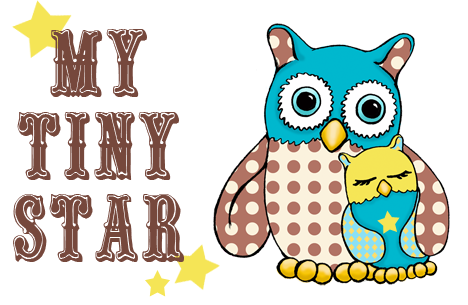 To enter this little giveaway just place a comment on this post telling me your favorite colors so I can make you the owl of your dreams, and if you want 5 additional entries just post a linkypoo from your blog to this post. The drawing will be held on Friday the 2oth of February. The winner's owl and pattern will be shipped the first week of March because we will be out of town till then. The pattern will be for sale soon in my shop, I will post here on the blog when it is available. Thanks for visiting my tiny blog! 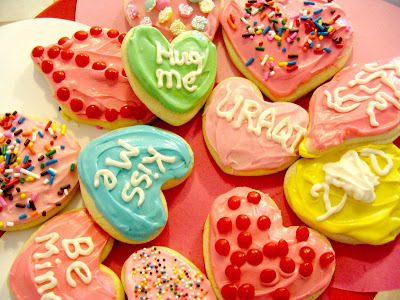 Happy Valentine's Day!!!! 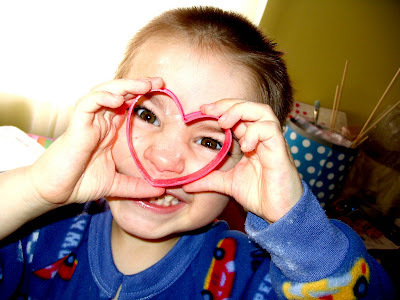 Hope you got all the hugs and kisses you needed today! I sure didn't, but I guess I'm pretty greedy when it comes to that kind of stuff. The kids helped make some fabulous cookies, and I think I ate every single one pictured here! 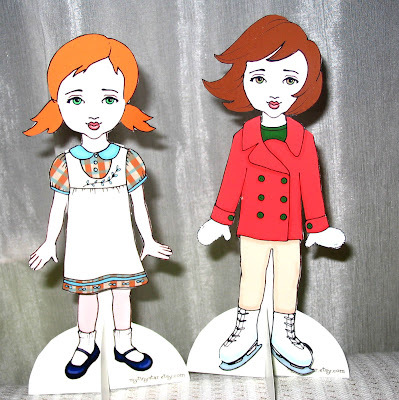 Here are a couple pics of my new paper doll prototypes. I started on them a few months ago, and because of technical difficulties I am still working on them, but I thought I'd give you a peek. I designed them to be customized to look like you or your child. I have dozens of hair styles and colors, I can change eye color, skin color, and I am working on a few different faces. I also have a lovely collection of outfits for the little dears. I made a mini version with girl and boy dolls for Sophia to give to her classmates for Valentine's day, and they were a great success. I wanted to post a printable version on here but I couldn't figure out how to post a PDF. Any tips would be great for future freebies! 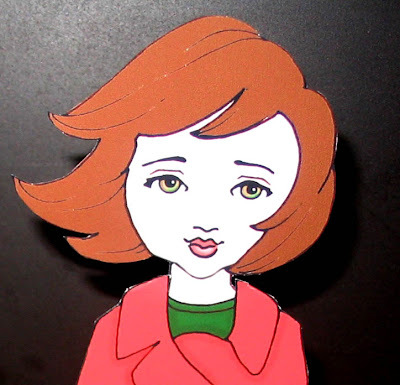 This is Sophia with the wind blown hair style in auburn, hazel eyes, and fair skin. I few months ago I noticed that my 3 year old sometimes calls me mom and sometimes calls me mommy. That isn't really out of the ordinary except sometimes he would correct me and others on who I was. Like for instance: Daddy would say, "go to mommy so she can help you wash your hands", and Isaac would say, "NO mommy, MOM"! Or I would sometimes say,"Come to mom so I can tie your shoes", and he would reply"NO mom, MOMMY"! It would always change and I could not figure it out for the life of me. Well, a few weeks ago the mystery was solved. As Isaac sat in my lap he looked at me and urgently said "MOMMY! ", "yes Isaac" , "No mom, MOMMY! ", "yes, I'm right here". He looked at me with great frustration and annoyance and began to tug at my glasses. "Isaac, mommy needs those to see", "MOMMY!"(tug,tug). So I removed my glasses to prevent their breakage, and Isaac let out a squeal of delight, threw his arms around me and said with joy, "MOMMY!!!!". Okay, I am mom when I have my glasses on, and mommy without them. It's great that I finally figured it out, but mom is developing a complex! It turns out Isaac prefers mommy's company over mom's. It really makes mom sad when he almost angrily begs for mommy in the morning, mom already had bad self esteem and hates to get out of her jammies. 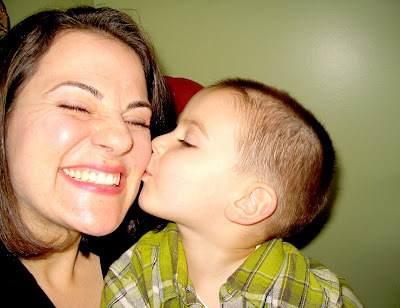 Mommy is just way too chipper and lively, and always has something fun planned. What's up with her? I guess I can see why Isaac likes her more, but it still hurts! He is so stinkin' cute, I just can't get enough of him! I'm sorry for my silliness, I just thought it was so funny that I had to share it.